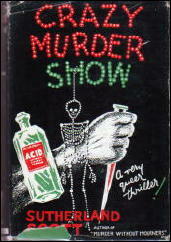 » Reviewed by William F. Deeck: SUTHERLAND SCOTT – Crazy Murder Show. I knew of Scott and Dodds, but never read any, but based on this I will give him one thing — he was singularly bad at titles. In reply, David, here’s a complete list of titles. Dr. Septimus Dodds appears in all but The Night Air Is Dangerous. A couple aren’t bad, but OPERATION URGENT? You have to wonder if he was entirely serious about this. One of favorite almost TV series was MISSION HIGHLY UNLIKELY. I was wondering if a review by an author as unknown as Sutherland Scott would make it all the way to five comments. If this one counts, he made it! I’ve seen information from this at GAdetection. Blood in Their Ink is by no means worthless as a historical document, but its organization is…eccentric. I kind of like The Influenza Mystery, which is one step up from The Diarrhea Mystery. And here I thought Sara Woods was pushing it when she started using stage directions from Shakespeare as titles. I wonder in THE INFLUENZA MURDER was a sequel to MURDER IS INFECTIOUS — a trilogy perhaps ending with NIGHT AIR IS DANGEROUS? Maybe OPERATION URGENT, TINCTURE OF MURDER, and DIAGNOSIS MURDER (wonder if he was the first to use that one?) followed suit. Dodd was a doctor, I suppose we can count ourselves lucky we didn’t get THE BEDPAN MURDER or the BEND OVER AND COUGH MURDER. My sister sent me this link. I have not read any of the books, but, since my name appears on the cover (albeit backwards), I thought I’d make an appearance.